It was with much excitement that I managed to purchase the $2 rectangular (242x333mm) canvases at Daiso. However i only got 14 of them. The rest of the 12 canvases, I finally found some at Bras Basah which was squarish at $2.20 per pc. In a way, it could be counted as an Advent project counting down to Christmas. Last year I decided to start a tradition of CREATING for Christmas. To create something meaningful and tangible for the family to remember our Saviour’s birth. We did a Nativity set from recycled materials complete with Shepherds as hand shakers, TP Rolls of Angels and a Sensory Bin to celebrate! This year we embarked on the A to Z of Christmas! I did my preparation and searched for the words from scriptures. I must say it wasn’t easy but it was really interesting and meaningful! I also read the whole passages of Matthew 1:18-25, Matthew 2:1-23, Luke 1: 26-56 and Luke 2: 1-40 on the birth of Jesus along the weeks. 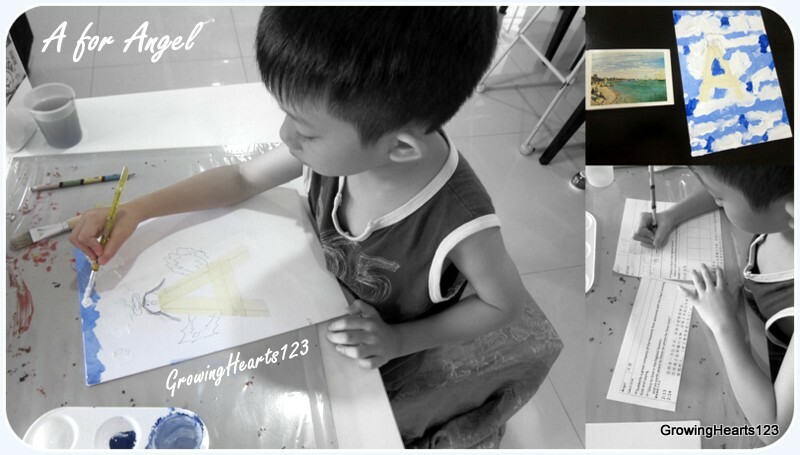 After which, we would begin our Acrylic Painting! I discussed with A what kind of picture does he want to create? We talked about Angels and he wanted to draw an angel in the skies. He had some difficulty with the skies, so I let him browse through Monet’s Postcards and he settled for one to observe and illustrate. 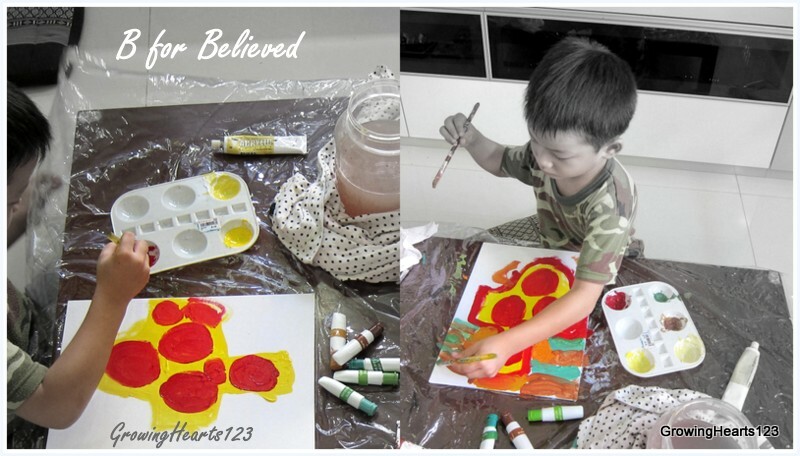 We discussed what does believe mean and how we can show in J’s painting. He said red for heart to trust and used my idea of the cross symbol to show our belief in Christ dying on the cross for us. He then selected yellow, brown and green for his painting. As he painted the bright yellow cross and added the red ‘hearts’ according to him (that in the end became circles) I was humbled by his ability to comprehend this word in such a childlike manner. Later on, he added a ‘crown’ to the cross which appropriately symbolised Christ the King! I was completely blown away by his expression! I couldn’t have done it better. E painted the background with her favourite colours and topped up the letter C with candy coloured beads etc. Matthew 2:12 And having been warned in a dream not to go back to Herod, they returned to their country by another route. This time round, E chose light blue, yellow and brown for her background. After we dried it, the next day, we discussed how dreams take place when we are sleeping most probably at night where stars shine bright. After she agreed to my idea, I added the dark blue D and suggested to her using gold to illustrate the stars. She was delighted at the effects and added her own studs of gems and golden beads. 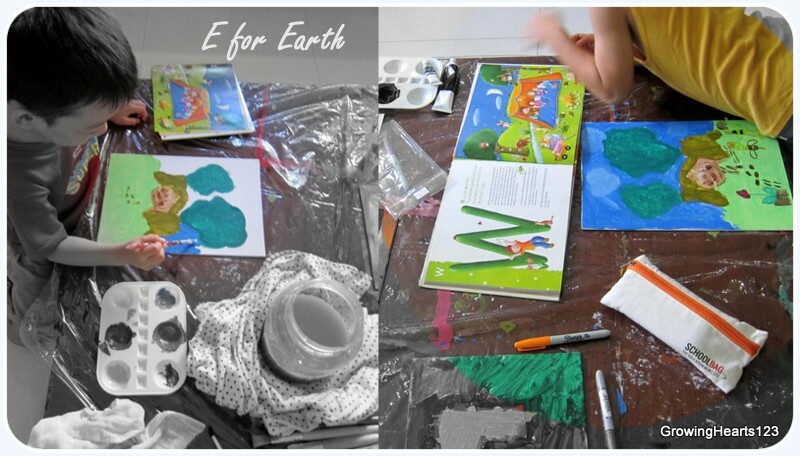 We discussed how J would like to illustrate earth. I made use of his prior knowledge when learning about the world in this case. Does he want his painting to be a globe? a map? or simply just a scenery on earth. I gave him several images and ideas which he settled for the scene below to express his idea of earth. He captured the gist from the visual reference and added a few more of his own imagined animals and people. For the final product, J did a collage for letter E which was cut out and pasted onto the painting. 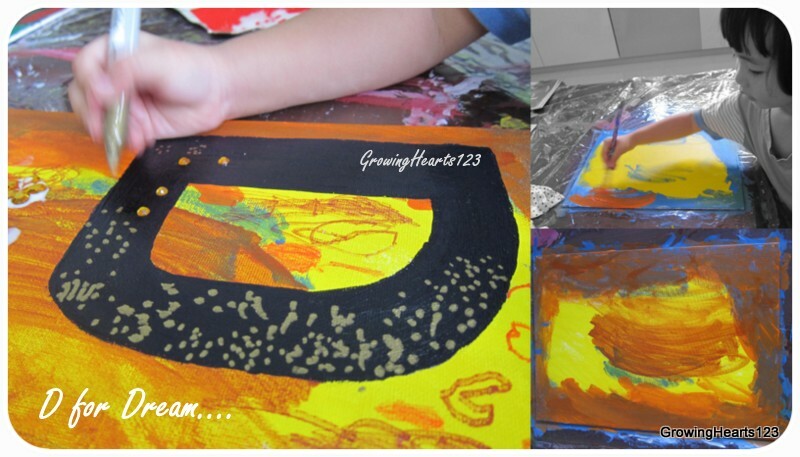 The E font was my idea as I wanted to teach them the different techniques of mixed media on canvas as well. This was an interesting topic I had with A. By now, they are familiar with the concept of forgiveness. Where as humans, we have sinned (disobeyed God) and could only be pardoned from our sins through the forgiveness from Christ dying on the cross for us to cleanse us and bring us back to God. He then suggested using Red which would mean the heart (which I added great, also could symbolise the blood of Christ), and interestingly he said green to mean ‘alive’ after being forgiven. Lastly, I suggested “How about gold colour?” the use of gold to symbolise purity. He was excited over the combination of colours and the below resulted. I had used masking tape to cover the F which A drew the Font by himself using freehand. 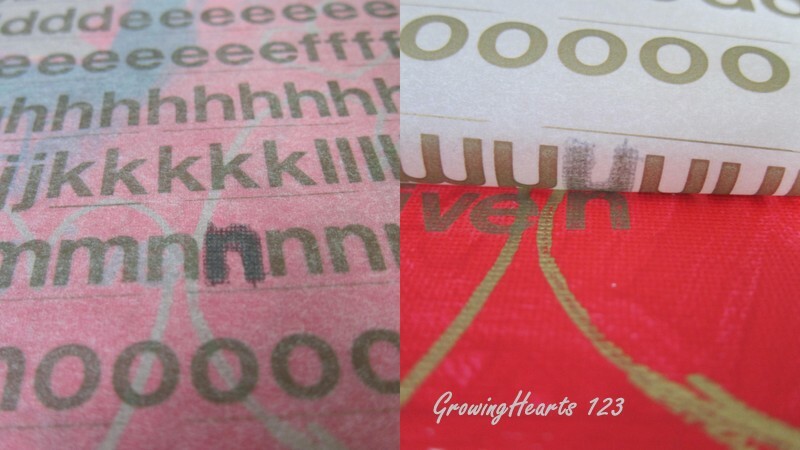 After he had painted his red and green, he blow dried the background and I took out the tape for him to paint the alphabet F with gold paint. For the first A to C set, each child takes an alphabet to paint. We spent one day about 1 to 1 and a half hours on the background. Then allowed them to dry before applying the next coat of drawings or pasting of materials the following day. This goes for the same for the second set D to F. After the kids are done with each set, I will cut out the bilingual verse to paste onto the painting and add the key word by rubbing the Geotype fonts below to render it complete. We’ll be doing the next 2 sets next week and I do hope that we can complete all 26 alphabets by Christmas! 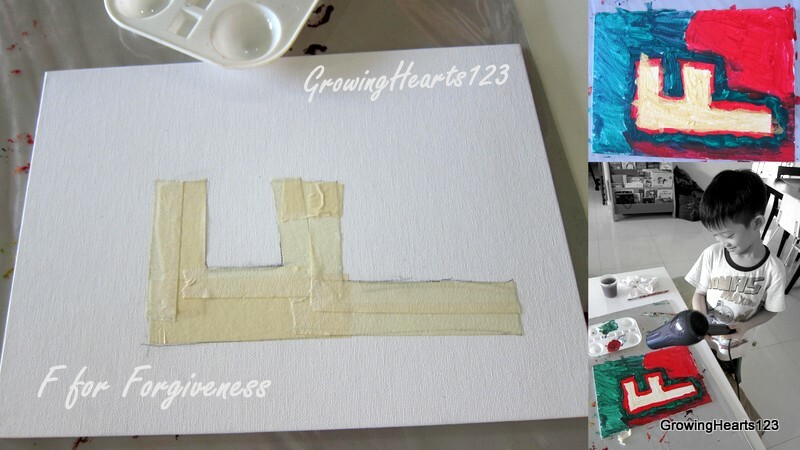 For this whole series, I will be detailing about 3-5 posts documenting the processes of our painting journey. This is an entirely new experience for me as I witnessed how my kids were able to discuss ideas and exchange views on how each key word could be expressed in their artworks. I had grand ideas on how I could give them ‘ideas’ on how to paint specific words, and ended up feeling humbled over how they’ve managed to awe me with their very own ideas and when allowed freedom of expression to paint. 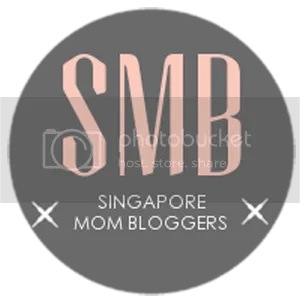 In my mind, I just thought they can handle the background and mummy will do the fonts. I am glad they wanted to have ownership of the whole process. This brings me to how I manage collaborating with them. You might have noticed, when I see appropriate opportunities, I would introduce some suggestions for improvement and provide visual references. If they are not keen, I would restrain from pushing my idea. In the end, we had a good time of communicating and exchanging of thoughts and ideas to make the painting a reality that could express at least partially the meanings of the words. However, there was one point where I almost had a tiff with A as he refused to paint or colour the portion properly (It was an ‘I can’t be bothered’ attitude). At that point, I did make a stand firmly on the need to execute at least a certain degree of excellence in painting/ colouring when it required so. I tried not to force him to accept my idea, but I made it clear that the excellent attitude behind that painting was important to have. He was only required to cover up those white spots existing in the font F as that was the subject matter. The background painting was fine as it was part of his own expression. After much careful explanations, he finally acceded to my request. Prior to this piece, I had to concede that A’s idea of the Angel was much better than mine! So i see myself learning how to let go by giving them freedom of expression and when to actually step in to guide them so that they can be stretched to their potential abilities. For the other series, hop over to G to L series, Series M- U and Series V-Z . Here are the FINAL ARTWORKS. May you have a blessed time this Christmas with your families! Thanks Christy! Thank God for the idea! I’m very touched and surprised by their expressive works myself! : ) May your family have a great Christmas too! This is awesome and very meaningful!! Thanks Angie! Indeed, I pray it will continue to stay meaningful for us this Christmas! : ) May your family have a meaningful Christmas too!